This global warming stuff is crazy. This is the third snow on the prairie this month. It is rare enough that we get snow in December, but three times! I still have a little snow on the ground from the Christmas Eve event. The weather guessers say the temperatures will warm above freezing overnight. There may not be anything to photograph in the morning, so here is the photographic evidence which includes my icy breath. Merry Christmas to all and best wishes for a joyous 2010! The prairie had its first snow of the season this morning. It did not stay around long. Every bit was melted shortly after 10 AM. Fortunately, I took a couple of pictures of the white stuff before I left for work. In all my 20 (times 2 and plus a couple more) years, I do not recall an earlier snowfall in Dallas. It's been cloudy, wet, and frequently cool almost every day this month. A few days ago, I found this little butterfly perched on the flower buds of a white mistflower bush. It looks like he is just waiting for the flowers to open. White mistflower, Ageratina havanensis (possibly Ageratina wrightii), is a butterfly magnet. The weather guessers say we will have a few dry, sunny days before it starts raining again next week. This should be enough time for the flowers to pop open. When that happens, the plant will be covered with butterflies, bees, wasps, flies, and various other insects and reptiles looking for a feast of one kind or another. Be patient, little guy. It won't be long. ...more pathways for wandering and more time for wondering. Now, I have so much more than I could ever have with a lawn. Earlier this month the Lawn Reform Coalition launched its website. The goal of the organization is to promote change in the American lawn. 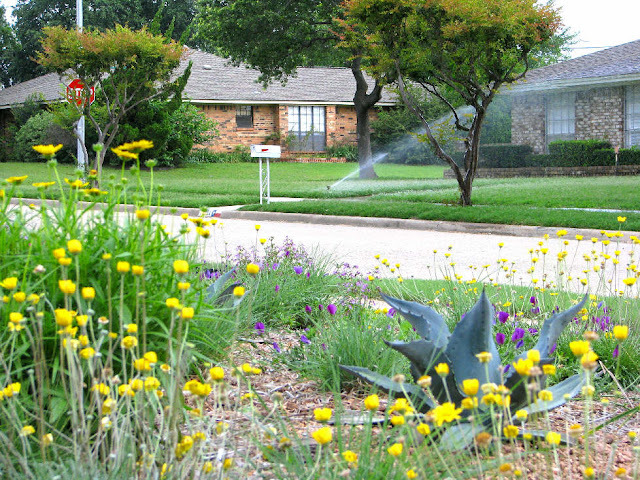 The typical American lawn is doused with chemicals to make it green and free of insects and disease. Lawns are flooded in more of our precious drinking water than necessary to keep them green. 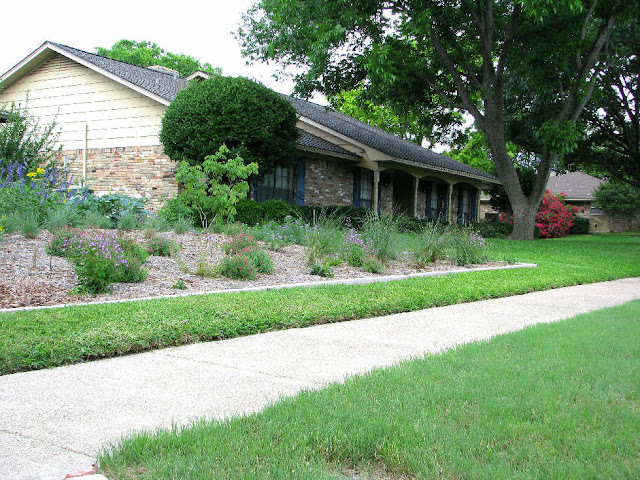 Lawns require regular maintenance that creates noise and air pollution. After all that work, the lawn is a sterile, monoculture environment that does little to support wildlife and it looks just like the one next door. Susan Morrison, one of the members of The Coalition, is running a contest on her blog Blue Planet Garden Blog to win a copy of John Greenlee's new book The American Meadow Garden. The premise of the contest is to fill in the blank: "I used to have a lawn, but now I have ______." Thus, the purpose of this post. I believe in the cause and I want a free book! Check out the Lawn Reform Coalition website and Susan Morrison's website for more information. A couple of shots from the backyard. From left to right: Snow on the Prairie (Euphorbia bicolor), Autumn Sage (Salvia greggii), and Pitcher Sage (Salvia azurea). 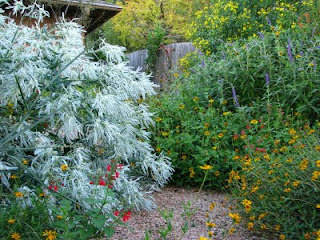 In this picture are Snow on the Prairie, Flowery Senna (Senna Corymbosa), Bush Sunflower (Simsia calva), Mexican Bush Sage (Salvia leucantha), Zexmenia (Zexmenia hispida), and Scarlet Sage (Salvia coccinea). It rained on my urban prairie two weeks ago. We received about 2 inches over the course of the week. The temperatures cooled from the 100s to the low 90s; creating a pleasant diversion from our typical hot, dry (but humid) summer. The rain is just memory now. The the soil is drying out again, however the rain did leave leave its mark. 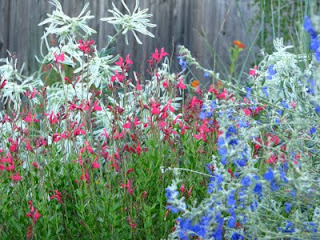 Several plants on the prairie burst into bloom in appreciation of the rain. Below is evidence of the rain. Beebrush, Aloysia gratissima, was covered in flowers and bees. It filled the backyard with a fragrance similar to vanilla. This compact Texas sage, Leucophyllum frutescens 'Compactum', was covered in flowers. I did not think about taking a picture until most of the flowers had faded. These rain lilies, Zephyranthes 'Prairie Sunset', are looking up to the sky for more rain. I wish I had a steady hand when taking pictures. I like the way the sunlight glows through the center of this rain lily. I believe this one is Cooperia drummondii. Maybe we will get another round of blooms soon. There is a slight chance of rain this week. We've had a couple of brief, light rains over the last couple of weeks that did no more than make the air more humid. As a result, the cracks in the prairie continue to grow. 10.5 inches deep. That is some deep soil aeration. Even in the dry, cracked soil, the natives seem pretty happy. The leaves on some of the less drought tolerant plants wilt in the afternoon sun, but they perk up as soon as they get some shade. We have chances of rain every day this week. Maybe we will get enough to close up some of the cracks. I am starting to get concerned that I will stand near one of the cracks and the soil under my feet will give way. I could fall in and never be heard from again. Plants in the photos: Little Bluestem, Four-Nerve Daisy, Winecup, Rock Penstemon, Blackeyed Susan, Agave, and Salvia coccinea.